You can download the whole pattern in pdf here: The stitchers Angel Sewing Bag. 2 strips 4 x 5 inch, 2 strips 14 x 3 inch and 1 piece 14 x 10 inch in fabric for the main bag. Use a pigma pen to trace the stitchery pattern. Centre the design and trace onto the fabric you have chosen to stitch on. This can be done by either using a light box or tpe the pattern and fabric to a window. I always use a very thin batting or iron-on Pellon behind my stitchery to hide the threads. Or just place another piece of cotton fabric behind the stitchery. I have used DMC embroidery thread in different colours. 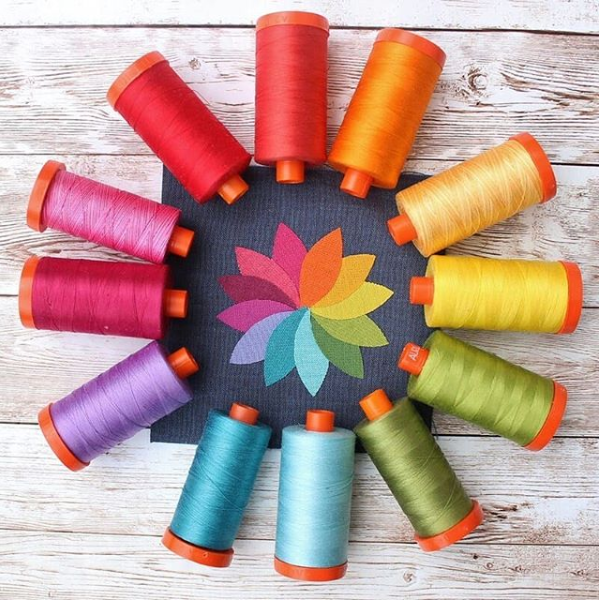 Just take a look in your thread scrap bag and use the colours that match the fabric you have chosen for your bag. You find the stitchery pattern on the pdf file. Take your two strips of 4x5 inch main fabric and sew it on top and bottom to the stitchery. Then sew the two strips of 3 x14 inch to the left and right side of the block. Make sure it measures 14 x 10 inches. Place this on top of your batting. Quilt as desired. If you don't dare to do any fancy free motion quilting, just quilt some slightly bowed lines. This will be the front of your bag. I often use another "old/ugly" fabric behind the batting to make it easier to quilt. Do the same with your 14 x 1 inch piece of main fabric. This will be the back of your bag. Now is the time to sew on your buttons to make the flowers on the stitchery. Place your two front pieces with the right sides together and stitch the bottom, right and left sides together. In the left and right bottom corner you draw a square of 2 x 2 inches. Cut and remove this square. Open the cornes and sew them together as shown on the photo below. Do the same with the fabric for your inside bag. But remember to leave an 5 inch opening in one of the long sides. Turn the inside bag with the right side out and put it down into the outside bag. Make sure the seam allowance in both sides meets and pin it together. Sew with 1/4 inch seam allowance around the top. Then flip the bag through the opning in the inner bag, sew the opening together and put the inner bag down into the frontbag. Make sure it looks ok on the top and topstitch along the top edge with 1/4 inch seam allowance. Sew the opening in the inside bag. Cut two cords 36 inch lengths. Using a safety pin on the end, thread one cord through one side opening in the cord casing. Thread the cord right around the bag and take it out through the same opening. Repeat for the secong lenght of cord, starting and finishing at the opposite opening. Tie the ends of the cords together. Your bag is now ready to be filled with the other projects presented by the Stitchers' Angel Designers. I hope you have enoyed making this sewing bag. It was fun designing it for you. If you are having trouble understanding the pattern, just send me an email and I will try to anser you. And I will love seeing photo of your bags so if you make it please send me and email with link to your blog so I can se. You have made just a fantastic "bag" for us. Hi May, thank you for such a great pattern and all the work you and the others are putting into this. Tack för en bra beskrivning! Fin bag, det röda tyget tyckte jag om. Hjärtat som ligger bredvid måste jag fundera ut hur man ska sy, kan det vara 9 st.hexagons...? thanks for a great pattern....perhaps it could have also included some time to make it! LOL.....I am keeping them all until I have some spare time.....2015 is looking good right now! Congratulations, wonderful pattern and tutorial, I'll defenitely make this one! Simply beautiful! Thanks for sharing with all of us this pattern and for your great work. a wonderful Idea! Love your bag. what a gorgeous pattern you designed - congrats & thank you for sharing. Den er nydelig May Britt og flott leksjon også! Skal anbefale til mange som ikke vet helt hvordan man kan sy sånne :o) Du er bare sååå flink. Ha en flott uke. Thanks for such a wonderful patern! your dear kind Angel. thank you so much, I must make this for my mortal. Thank you thank you thank. Can you tell I like it. Tusen takk for et nydelig mønster. Denne blir jeg absolutt å lage. I like the bag and LOVE the stitching - beautiful design May. This project is just so beautiful. May Britt that is absolutely the most wonderful bag. Oh May you've done a wonderful job, beautiful stitchery. Thank you for the very useful tutorial. I'm glad you're getting better. Lovely Angel bag - thanks for sharing such a great pattern. I love this bag, as you know I have wanted the pattern for a long time, thank you, thank you May Britt. Great bag. Hoping to find a moment or two to make it. Thanks for the tutorial. Your time is appreciated. Beautiful bag....!! hermosa bolsita me encanta. Gracias por el diseño y el tutorial tan bien explicado. I have read your blogsite a few years now. 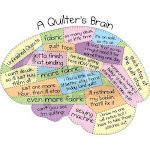 And I have to admit you have been one of my most inspirising quilters' paragon. You have shown me a lot new things about quilting world. Tack för dig! Och jag är mycke glad att du är en av Stitchers' Angel Designer. This pattern is great! I love angels! Thank you so much! Oh i've been wondering how to make these, i've tried several times but didnt like what i was left with! It's lovelly your bag and pattern!Thank you dear Angel for your work. I will make this bag, for sure, when my work rotine begins! The bag is just adorable!!! Thank you so much for the work you've put into it :o). Can't wait to make it!!! Thank you! I so appreciate all of the work you and the other Angel Designer's have done. It is so fun each week to see the new project...I'm going to make them all! I love this!!! I'm sure I could do this even though I only have a few months sewing under my belt. But I wouldn't do it for awhile, this is something I know my mother in law would love even more! I hope you don't mind I added your URL to my blog! My mom is/was big into sewing she might want to take a look at your blog! I looked at afew of your projects and I have to say I love the little makeup bag, it would be so easy for me the way you layed it out for everyone! A beautiful pattern! I really loved the stitchery. Thank you! I have so much enjoyed making your bag! thank you so much for this delightful treat! What a a beautiful bag! Hello! Thanks for the lovely tutorial. Encarni from Granada Spain. Oh, what a wonderful cuuute pattern ! And with such good explanations and pictures... You did a GREAT job, dear ! You did a great job, what a wonderful angel. I stitched mine not as a bag, I needed a bookcover. thank you so much for your great idea, wonderful! I come from France to visit you ! Very Cute May Britt! 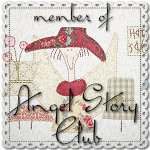 Thanks for sharing your angel! Great bag...I know just the person I need to make this for. Thanks for the wonderful tutorial! Thank you for this lovely pattern. For now I will be just doing the stitchery. But I keep the pattern and will make the bag as soon as I have time. Kjempesøt engel og flott framgangsmåte. Tusen hjertelig takk! Thankyou for the beautiful bag pattern, I am going to start making this one today. Thank you so much, May, for the terrific bag. I finished one tonight using a Miss Millie stitchery. The directions were great. HOLA!!! El bolso está precioso y el tutorial muy fácil. Saludos desde Costa Rica y muchas gracias. This bag is so cute. Thank you so much for the pattern! Love your blog. Love browsing through the posts to look at the many different Angel Bags. They make very lovely gifts.